From the beginning, Dr. Pareena G. Lawrence set out to empower women and defy limitations set for them, especially in the gendered society of her home country, India. For Lawrence, that calling came through economic policy. After completing degrees in economics at the University of Delhi and Purdue University, Lawrence entered the higher education realm, serving as a faculty member at the University of Minnesota, Morris, and then as provost and chief academic officer at Augustana College. 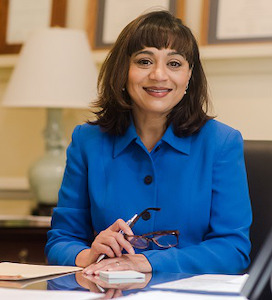 Now, Lawrence has brought her combined economic training and understanding of the power of sisterhood, allies and friends to Hollins University in Roanoke, Va., where she is the first minority woman to serve as president of the all-women’s institution in its 175-year history. Lawrence believes her economics background will prove to be instrumental in helping her complete her tasks as president — planning budgets, forecasting the future of the institution and dismantling systems on campus that may be detrimental to students while promoting those that prove helpful. As one of 37 women’s colleges in the United States, Hollins has played a “tremendous role” [AB1] in preparing its students for the workforce and for public citizenship, Lawrence says. Students are encouraged to make a difference in the world in their spheres of influence and use their education to improve themselves and their communities. Likewise, college access is important for Lawrence. While the institution does not have a significant endowment, institutional leaders work to ensure that students “who are well prepared are not turned away,” Lawrence says. Currently, 43 percent of Hollins students are Pell recipients or Pell-eligible. Last year, the institution launched a Global Commitment Scholarship, which provides five full-tuition scholarships to women across the globe with high need who want a Hollins education. A similar scholarship initiative is in the works for women in the local community. A champion for all women, Lawrence has documented the expansive role that women play in international economic development and co-authored a book titled Life Histories of Women Panchayat Sarpanches from Haryana, India, about 10 women leaders and their impact on their communities. At the 2018 annual meeting of the Association of American Colleges and Universities, Lawrence gave a compelling keynote speech about when institutional values of fostering diversity and inclusion and protecting free speech collide. She emphasized that institutions must do better at creating a climate of belonging on campus and care where students can simultaneously engage in civic debate on issues they are passionate about.